A large explosion has rocked Syrian capital Damascus striking close to a military compound, near a hotel used by the UN’s observer mission. Syrian state TV reported that three people had been injured in the blast, but that none of them were UN monitors. 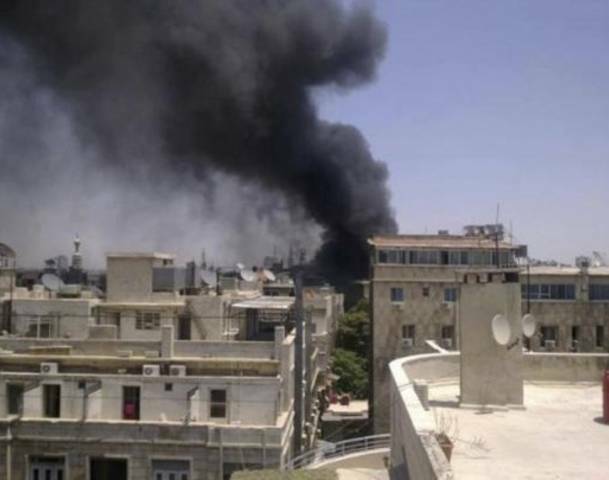 Eyewitnesses in Damascus saw a huge plume of smoke coming from the area in the city centre and several ambulances were seen rushing towards site. The intended target of the explosion was not immediately clear. State television said it had been caused by a bomb near a fuel truck planted in a car park near the hotel, but other reports suggested it had been an improvised explosive device (IED). The area around the hotel, the Dama Rose, is a sealed-off, high-security zone. There are several government and military buildings in the vicinity. Images from the scene showed UN vehicles covered in dust and debris. There were reports from activists of other blasts around the city but these could not be immediately verified. Syria’s Deputy Foreign Minister Faisal Mekdad told state media it was “a criminal act aimed at distorting Syria’s image”. The latest violence comes as a group of Islamic countries prepares to meet in the Saudi city of Mecca to discuss the crisis. The 57-member Organisation of Islamic Co-operation is expected to suspend Syria’s membership, despite objections from Iran, Syria’s last regional ally. The violence in Syria has spread to the capital in recent weeks. Last month a bomb at the national security headquarters killed three of President Bashar al-Assad’s security chiefs.